What is Saint Anything about? Saint Anything had everything I’d come to expect from a Sarah Dessen book. I’ve been reading Sarah Dessen for quite a while and I love her writing. In Saint Anything, she presents another great story and amazing, relatable characters with her trademark writing style that I’ve come to love. One of the things I really loved about Saint Anything was the wonderful characters. I really liked Sydney, the main character, and found her to be really relatable. Sydney is going through a really rough time with her family and dealing with how her brother’s actions have affected the family. She befriends another family, particularly brother and sister, Layla and Mac. It is great to see Sydney making friends at her new school and getting to know Layla and Mac. I loved their family’s pizza shop and how Sydney always went there after school. Like I said, it was just great seeing Sydney gradually grow closer to this wonderful family. The one thing that I found myself angry at with Saint Anything was Sydney’s mom. I feel like she was punishing Sydney for what happened to her brother and that’s just not fair. Even though her brother Peyton was no longer living in the house, all discussion and thoughts revolved around him. I just really felt bad for Sydney, because she felt lost and forgotten in the midst of Peyton, even though Peyton himself wasn’t even there anymore. I got so angry at Sydney's mother, in particular, that I just wanted to yell at her so bad. She was neglecting her other child in order to coddle and baby her son, who is almost an adult and should deal with and own up to his actions on his own. I feel like if Sydney had been like Peyton, her family’s behavior would have most definitely pushed her to get into trouble as well. But, that isn’t a negative. I like to get angry and feel emotions when I’m reading. Sarah Dessen did a wonderful job! Like I talked about earlier, I really loved the emphasis on family and friendship in Saint Anything. While Sydney was being neglected by her own parents, the Chathams generously took her in and made her feel welcome. You could feel what a loving, tight knit family they were, and I loved that. As I talk about quite often on this blog, I love it when there is emphasis placed on family and friends, and Saint Anything definitely gets an A+ in that department. I loved watching Sydney and Layla’s friendship grow and how much they both helped each other. Layla was such a great character and I loved her personality. (French Fry obsession? I think that’s a first) Same with Mac. I thought he was super sweet and getting to see a brother/sister relationship was definitely a plus. Overall, I loved Saint Anything and I am once again, impressed by Sarah Dessen. There were so many more amazing aspects of this book and things I liked, but I can’t mention them all in one review. I think Saint Anything was a wonderful portrayal of family, friendship, and how it is family and friends that really get you through hard times. I loved seeing Sydney grow and change and her and Mac were simply adorable. 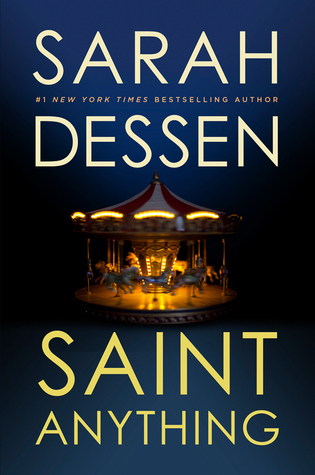 I think longtime Sarah Dessen fans and ones new to Sarah Dessen will both really enjoy Saint Anything. Have you read Saint Anything? Did you have a craving for pizza and French fries while reading it? What were your thoughts? I agree. I've read a couple of Sarah Dessen books that weren't the greatest, but, I do really love her books and writing. Friends and family in YA are great <3 There definitely needs to be more. A wonderful review! I enjoyed this book as well and I completely agree with you, I found the family aspect to be done very well and Sydney's mum grated on my nerves too. 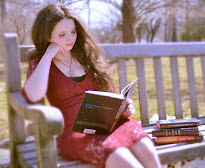 I think the fact that you feel so emotionally attached to the characters to the point that you feel angry at any injustice done to them is a sure sign that an author knows how to flesh out the characters in her story and connect you to them. I have never read anything from Sarah Dessen before but I know for certain that she's popular and good at what she does. Plus, a YA book with family in it is a huge bonus... there's not much of it in this category, which is sad and surprisingly considering they're still important to a teen's growing life! Great review Olivia! I've only read one book by Sarah Dessen, but I have heard wonderful things about her writing. This book in particular sounds great!